Rick and Cindy Johnston have been in Ballymena Northern Ireland since June of 2009. 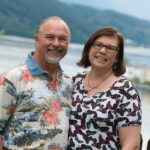 Originally called as missionaries to help with a local Calvary Chapel, Rick is now pastor of Calvary Braid Valley in Ballymena, Northern Ireland, a work they started in 2014. Together with Cindy they disciple and minister to individuals both within CBV and in the community. Rick is also teaching a mid-week Bible study and a monthly in-depth study. Cindy started a women’s Bible study in September 2014 which has not only built up the faith of ladies from CBV, but has also reached out to women from several local churches. They are involved in a variety of ministries in the local community including Scripture Union, a prison ministry, cross-community (that is, Protestants and Catholics working together) endeavours and several prayer initiatives. A driving passion, along with seeing people come to faith in Jesus of course, is to see church unity – so the churches can be seen by the community to be working together to promote the cause of Christ.